Guides are horizontal or vertical lines that you can add to your canvases to help you to position items precisely. Guides can be placed anywhere on your canvas – even outside of your working area. Guides won't appear in your finished animations, but they will be saved with your documents. Each canvas has its own set of guides. If you imagine guides are made of metal, handles act like magnets around guides, snapping onto them when they get close enough. This means that, using guides, it is easy to ensure handles are in particular places. Position handles, vertex handles, tangent handles, radius handles, width handles and angle handles can all snap onto guides. This means that you can use guides to accurately position anything and everything in Synfig Studio. There are three ways to add guides to your canvases. You can drag them from the canvas window rulers, you can click on the canvas window rulers or you can add guides using the Canvas MetaData Panel. You can add a horizontal guide by moving your mouse over the horizontal ruler at the top of the canvas window, holding down the left mouse button and then dragging your mouse downwards. To show you that you are positioning the guide, it will appear as a red dashed line. When you release the left mouse button the guide will be placed on your canvas and the red dashed line will become blue. You can add a vertical guide by moving your mouse over the vertical ruler at the left of the canvas window, holding down the left mouse button and then dragging your mouse to the right. To show you that you are positioning the guide, it will appear as a red dashed line. When you release the left mouse button the guide will be placed on your canvas and the red dashed line will become blue. Each time you click on the horizontal ruler at the top of the canvas window, a horizontal guide will be added at the horizontal centre of your canvas. Each time you click on the vertical ruler at the left of the canvas window, a vertical guide will be added at the vertical centre of your canvas. In Synfig Studio more than one guide can share the same position, so by repeatedly clicking on a ruler you will end up with a stack of guides in the same position. You can use the left, right or middle mouse button to click on the rulers. Advanced users may sometimes want to add guides using the Canvas MetaData Panel. The Meta Data Panel stores its data in Synfig's internal units, not in pixels, points, etc. To show you how this works, we'll open a new file and add a vertical guide to the centre of the canvas. Type "0" and press ↵ Enter. A new vertical guide should appear at the centre of your canvas. The "guide_x" Key in the Meta Data Panel stores all the vertical guides on the current canvas. It stores them as a list floating point numbers separated by spaces. The "guide_y" key in the Meta Data Panel stores all the horizontal guides on the current canvas. It stores them as a list of floating point numbers separated by spaces. Go to menu in the Canvas Window (use the Canvas Menu Caret button in the upper left corner) and select "View → Show Guides". 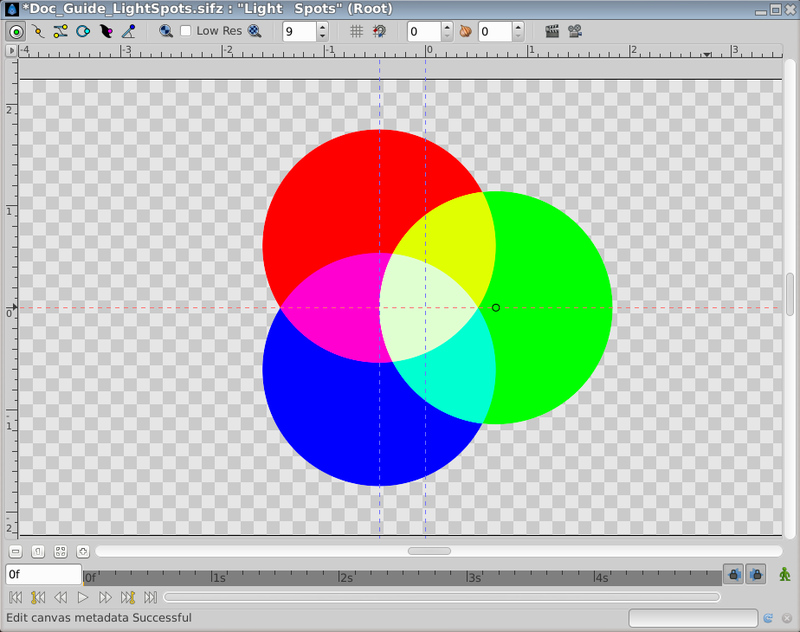 The default guide color in Synfig Studio is blue. This may not be a useful color for your work, but fortunately you can change this color. You can adjust the color of the guides on the current canvas using the Meta Data Panel. Double click on the Data column next to the "guides_color" Key in the Meta Data Panel. This will allow you to enter values. Enter the red channel guide color has float value between 0 and 1 included. Enter the green channel guide color has float value between 0 and 1 included. Enter the blue channel guide color has float value between 0 and 1 included. Go to menu in the Canvas Window (use the Canvas Menu Caret button in the upper left corner) and select "View → Snap to Guides". This page was last modified on 17 April 2015, at 07:21.